Joe Powell, Director of All Wales People First reflects on how the voice of people with a learning disability has grown. In the early days self advocacy was new and it took time for people to find their voice. The next generation on, young people with a learning disability are more confident, know their rights, have high aspirations so know how to get their voice heard. I think if I was to try to sum up self-advocacy in one word it would be the word voice. Making your voice heard is the cornerstone of building real lives for people with learning disabilities across Wales and over the last twenty years, indeed since the advent of the All Wales Strategy in 1983, those voices have become more and more prominent. I personally believe that this is something that Wales in particularly has excelled in, to the point where having genuine voice has been ingrained within the social care structure. 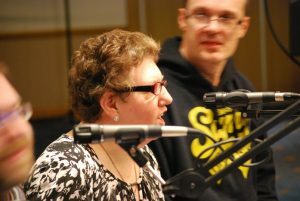 One of the biggest proponents of that voice was undoubtedly parents and carers, of people with learning disabilities. At a time when people with learning disabilities were still labelled as being ‘mentally handicapped’ and the idea that they could be included in these conversations was taboo, it was the war weary and battle hardened parents of people with learning disabilities who were the flag bearers of a new Wales, a Wales in which the reality of institutions like Ely, would be transformed into a poor memory from the past. A past we are all grateful has gone and has become an important symbol of what can happen when we don’t see people with learning disabilities as equals. Since the advent of self-advocacy in Wales, people with learning disabilities have been able to join the parents and the carers in this crusade for change. Those who can speak up for themselves are able to do so and I would like to think a symbiotic relationship exists between the dual approach of real voices, from real people whose lives are affected at a grass roots level, have become an integral component of shaping policy to make sure that the way we deliver services and support are more in line to real need, but also Welsh culture. Don’t get me wrong, there is still an awful amount of prejudice and injustice happening for people with learning disabilities in Wales. We are still a long way from where we need to be and we have still inherited a lot of bad practices and attitudes from the past, attitudes where people with learning disabilities are still treated as second class citizens or in many cases, with positive discrimination. Nonetheless, it is however markedly different from the experiences of previous generations in the old institutions and we must never forget that whilst so much needs to change, so much has changed for the better. The process of change takes time and voice is the salt that melts the iceberg of change. But it does take time and we must realise that everything we have done has made a difference, even if it has been so gradual over so many years that we don’t always immediately recognise it. People with learning disabilities have a much greater voice today than they did yesterday. Even if there is still a long way to go. Within self-advocacy one of the biggest challenges has been in encouraging people with learning disabilities themselves to play an active part in society. To win their confidence and overturn their experiences of living subservient lives as second class citizens has been a long and arduous journey. Convincing people with learning disabilities that they are equals and can make a real difference to the quality of their own lives by exercising political choice and speaking up for their rights is integral to getting that voice heard and recognised. This is why we must protect self-advocacy. This is why we must always encourage people to use their voice. I see the legacy of the benefits of self-advocacy amongst the younger members of self-advocacy groups. It is heart-warming to see that they are often more confident than the generations that went before them and take many of their rights as granted, just as their none learning disabled peers do. I believe this is a sign of the times we are living in and the effect time has on shaping voice. The publication Llais too has also been about voice. In my opinion it has been the single most important chronicle of the struggles, successes and failures of the learning disability sector in Wales since 1989. I would advise anyone who wants to learn about the history of the learning disability sector in Wales to start with Llais. I was initially saddened to hear that the paper publication has ended, but encouraged that Llais will still exist in a different format. Sometimes it is not just the voices that change over time but the medium in which that voice is expressed. Sometimes it is as much about the singer as it is about the song. Llais has effectively managed to orchestrate the collective voice of the membership of Learning Disability Wales from a wide range of perspectives and represent those voices accurately and with real authenticity. I wish Learning Disability Wales the very best with helping Llais find its new voice and I thank them most sincerely for allowing All Wales People First to express the voice of our membership and self-advocacy over the years.